Pro Image Shirts & Signs Serving Jackson TN | Window Tint & Vinyl wraps! Pro Image Shirts & Signs is owned and operated by Kevin and Amy Lewis, and located to serve Jackson, TN, Humboldt, TN, Trenton, TN and all of West, TN. He provides a unique veriety of services to the area including: Vinyl Vehicle Wraps, Signs, Graphic Design, and Digital Printing. Kevin has been designing for 18 years! Whether it is your business, home, or your vehicle that needs attention, he can do it. He offers high quality films and graphics to suit your needs and tastes. Pro Image also offers Digital Graphics Design--this includes custom decals, custom vinyl art work, digital printing, and custom vinyl vehicle wraps. 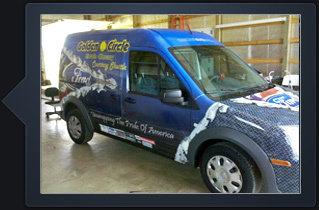 Custom vinyl vehicle wraps are a great investment that will quickly and easily pay for itself. Turn any ordinary vehicle into a billboard with wheels by wrapping your vehicle in a vinyl design that is only limited by your imagination! This will give your company an edge in advertisement. Pro Image provides quality work at an affordable price, while providing exceptional service. We believe in building lasting relationships with our clients, so we encourage you to add us on Twitter or Facebook below! Vinyl car warps transform an ordinary car into a rolling advertisement, with designs that are guaranteed to get your vehicle noticed, and most importantly generate business for your company. 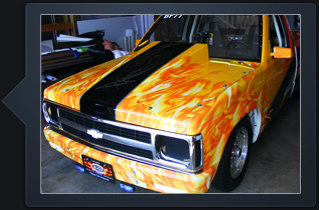 Call us today for a quote on a custom vinyl vehicle wrap in the Jackson and West Tennessee area. Vinyl vehicle wrap designs are limited only by your imagination. Wrapping your car in a custom vinyl is a great investment! It can even make your car payments because of the revenue you generate. Pro Image can design custom artwork for your signs, car, and can even apply stripes and lettering to law enforcement vehicles! From simple lettering to complex entire vehicle wraps, Pro Image can handle your design needs. You will get one on one consultation to make sure that the job is done right and to your expectations. Click Read More for more info! Pro Image offers custom high quality Digital Graphics Design. Whether you want to put your logo across the back of your company vehicle, or cover the entire vehicle in a custom vinyl wrap, Pro Image can design and/or print a design for you. Contact us for custom artwork and graphics design! Whether you need a simple logo or a complex vinyl wrap for your vehicle, let Pro Image Tint & Graphics take care of your creative graphics design needs. Whether your logo needs to go on your company vehicles or a billboard, Pro Image has the modern tools and software to make it happen quickly, efficiently, and affordably while providing excellent quality!. We're located to serve Jackson Tennessee and the surrounding counties in West TN. Feel free to call us for a quote! Click Read More for more info! Large format printing is just one of the many things we do. We are deep in experience in this specialized field. We take pride in our craftsmanship, and guarantee your satisfaction. 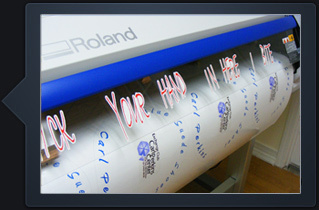 When you want your large format printing done perfectly and on time, every time, talk to us! Our sign and vinyl banner print shop can produce outdoor or indoor vinyl banners seamlessly, in any size needed.. We also print full color signs in any size. Tired of that old boring vinyl lettered sign or banner on the front of your business? Imagine having a full color, eye catching, design that looks as if it is jumping off of the board or banner itself. Our facility includes a complete print shop with wide format printers and a complete finishing shop for laminating and mounting on board. We have the skill, and the capacity, to turn your job around quickly and affordably. Kevin Lewis is a Fellers Certified viynl wrap installer right here in Jackson TN! He provides the expertise needed for high quality wraps. Click "Learn More" to find out more! If it weren't for these people, we wouldn't be where we are today! This is a page dedicated to our highly valued individuals and businesses! Click "Learn More" to find out more! Pro Image uses top of the line brand names to ensure quality long LASTING workmanship that will be around for years to come. Click "Learn More" to find out more! E-mail us and we'll get back to you with a quote ASAP!